Why Do Americans Hate High Residential Densities? Most Americans dislike density because they are so utterly car-dependent. Since cars consume vast amounts of space, higher density is despised because, by definition, density creates compact, human-scaled spaces. Therefore, it is an awful aggravation to own a car in a dense place. Given this, Americans understandably are violently opposed to density. 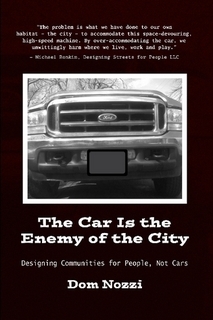 By being a motorist, one has a strong vested interest in opposing density. Even “greens” and “liberals” (many of whom are motorists) often oppose higher densities. 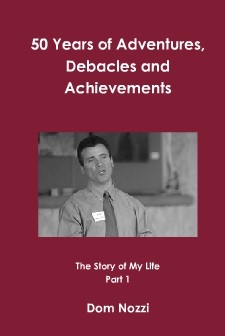 The photo below illustrates the problem. With just a tiny number of people in an area (in this case, 40 people), there is gridlock. No surprise, then, that there is growing bi-partisan support for a “no growth” agenda. Both Democrats and Republicans now join in opposing density and growth (which they view as the beginning of road and parking lot congestion — for a motorist, congestion is Armageddon). 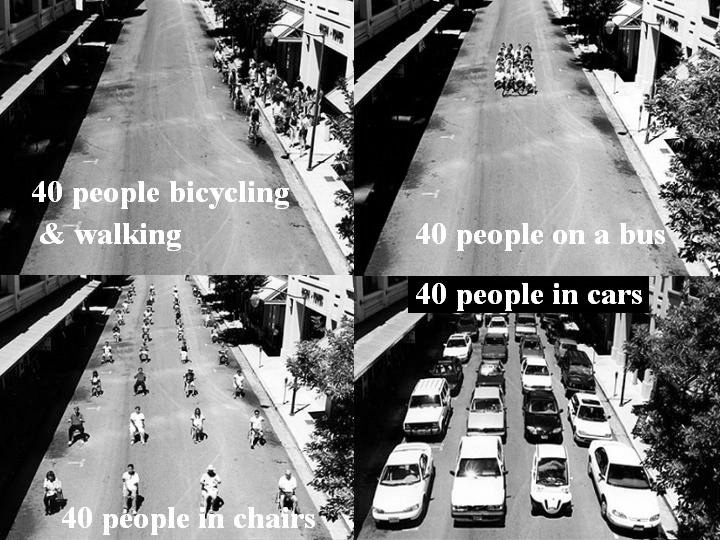 One thing the photo clearly demonstrates is that since only 40 cars are needed to congest a street, it is nearly impossible for a healthy city to not have congestion. And that widening a road will almost immediately re-congest when a few more cars are added. The solution should be obvious: don’t widen roads. Instead, create design that allows those who cannot tolerate the congestion to avoid it: connected parallel streets, more density, more transit, more mixed use (housing interspersed with jobs and shopping), staggered work hours, and so on. 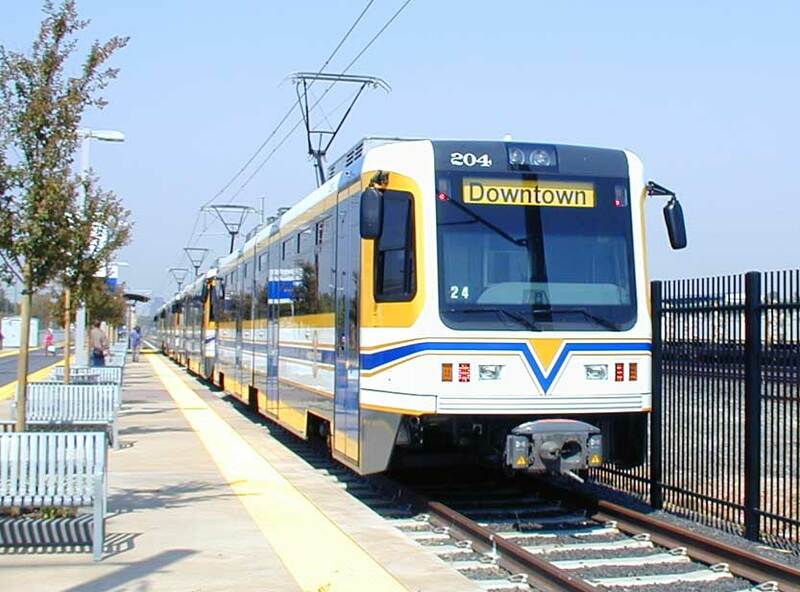 Is Rail a Practical Option for a College Town? In my response, I told him that one thing I’ve worked hard to point out in my work as a transportation planner is that when transit is proposed (particularly expensive transit), conditions need to be in place to make reasonable ridership rates more likely. In my research and experience, I informed the student, it seems quite clear that even with very high quality and very frequent transit, very few “choice” riders will choose transit over car travel. “Choice” riders are those who are wealthy enough to have a choice as to whether to travel by car, or other means (such as rail or bus transit). In unhealthy, unsustainable American communities, only those without a choice tend to use transit (homeless, low-income, students, etc. ), and even then the number of transit riders tends to be very low. Why will so very few decide to use even quality, frequent transit? Largely because America, as my books note, begs people to travel by car as often as possible. Roads are free to use, gas is artificially cheap, distances are enormous, cars provide unparalleled comfort and privacy and prestige, cars carry a lot of passengers and cargo, cars are almost always much faster, and perhaps most importantly, 98 percent of all parking made available to American motorists (according to Shoup) is a free parking space. Given this, I asked the college student, isn’t it irrational to use even quality transit when all these factors are in place? Communities, I pointed out, end up spending huge sums of money to provide transit and end up with the “empty bus” syndrome, which is VERY bad for transit public relations (motorists get angry when they see empty transit vehicles after all the public money was spent). Empty buses and trains give transit a public relations “black eye” that hurts the future political prospects for better transit. About 15-20 years ago, the college town of Gainesville, Florida (where I was a senior city planner) set up a circulator bus (which was festooned to look very much like a trolley car) that provided frequent service between the university and downtown. The fare was 10 cents. Almost no one used it. The lesson from all of this is that without conditions conducive to transit being in place, it can be a very bad idea to spend money for transit. Even quality transit. Because despite conventional wisdom, it is not the lack of quality transit that keeps people from using transit. It is the excessive provisioning for car travel that keeps people off the trains and buses. The first task for more healthy, well-used transit, then, is to make car parking scarce and priced. If that is done, even poor-quality, infrequent transit service will be regularly used (and I should hasten to add that with scarce and priced parking, sufficient political will is generated so that the transit quickly becomes high-quality and frequent). Ratcheting down the extreme pampering and subsidizing of American motorists, in other words, is the starting point for better transit ridership. The initial step is NOT to provide better transit. Only when conditions are not heavily tilted toward happy cars (tilted toward cars with such features as free and abundant parking) will the political will emerge to make it feasible for a community to be willing to invest in quality transit. Note that ending motorist coddling will not only result in more political and community interest in better transit. Reducing the excessive privileging of motorists will also, over time, create community development patterns that are conducive to better transit. Higher-density homes, retail and office will begin to emerge in town centers, major intersections and important street corridors, because a community that makes car travel pay its own way will be one where development patterns that allow residents to travel by transit (as well as walking and bicycling) will become more desirable and sought after by homebuyers. Why? Because there will be an increase in the number of residents seeking ways to travel without having to put up with expensive, difficult car travel. And compact development provides that form of travel choice. The high transit ridership by college students in Gainesville is therefore completely predictable. Parking on the university campus is scarce and expensive, which makes high demand for quality transit service inevitable. Tragically, by contrast, Gainesville has far too much free and abundant parking in its urban area off the university campus. The city, importantly, also has residential densities that are way too low to support transit. Happily, the days of free and abundant parking – even in car-happy cities such as Gainesville – are coming to an end due to rising gasoline costs and the related economic woes that America is now saddled with. With parking becoming more scarce and more priced, residential densities conducive to healthy transit will start appearing. And that will bring the emergence of quality rail, bus, and maybe even maglev to cities such as Gainesville.